Leo is out of school this week, which is why you haven't heard much from these quarters. We intended to spend the week hiking, but instead we spent our time stuck inside, watching rainstorms, rainbows, seeing the soaking-wet trampoline steam when the sun makes a brief appearance, and wondering whether we're going to have our first-ever snow. As you can see, Leo gets giddy over Speech With Milo: Verbs ($2.99) and the new Speech With Milo: Prepositions ($1.99). The interface is somewhat text-based, but it is also consistent & predictable, and Leo has learned to navigate from screen to screen. 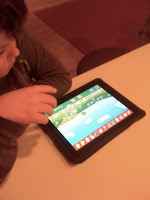 Leo can use all the quality language-building (as opposed to communication/AAC) apps you can create, developers, so please let me know when you're ready to open those floodgates. Leo & his peers are waiting. My Underwear ($2.99)* is the cutest damn app. It was designed by Todd Parr so the graphics are whimsically excellent. The games and activities are simple and fun, and Leo enjoys them -- games like "catch the falling underwear" are just unpredictable enough to keep him on his toes, while remaining straightforward and not-overwhelming. Another lovely bonus of My Underwear: sibling interaction facilitation. That's a fancy way of writing that OMG Leo & his little sister play My Underwear together! Not something we see a lot of -- Mali is wary of her sometimes volatile older brother. But with My Underwear, Mali is not just willing to play it with Leelo, she's patient and kind (two words we don't use a lot with her, awesome as she is) in showing him what to do if he gets stuck. Thank you, Todd Parr! Silly Numbers $3.99 was recommended to us by Danielle Samson, an SLP and an iPad/AAC/apps expert. Leo is a sucker for apps with good music. I am a sucker for any app that encourages Leo to independently and repeatedly review subjects in which he needs support, like 1:1 correspondence and counting. This is not a terribly complicated app -- each screen shows a number from 1 to 12, then that number of objects appear onscreen. But it is interactive -- you can tap the objects to count them over and over again, the animations are cute, the voiceover and text includes adjectives, e.g., "One Tasty Pie," for some stealth extra learning, and the design is top-notch. The Itsy Bitsy Spider ($.99) by Duck Duck Moose is not a new app but it is new to us, and was another Danielle recommendation. If you know Leo you know he loves music and singing his favorite songs, like the eponymous tune. Getting to play that tune over and over again while fiddling with pages full of animated extras means even more loving. And that loving is ever helpful in situations where Leo needs distracting from what he doesn't love, for instance visiting his pediatrician (thank you, Duck Duck Moose!). Andrew Answers ($2.99)* is an interactive book supporting language building through word play, repetition, and cheekiness. It also has interstitial activities during transitions, which Leo appreciates. His sisters think Andrew Answers is hilarious, so do I. Though if your kids are clever enough to model Andrew's sassy way with words, you may be in for some exasperation. Little Bella - I Close My Eyes ($.99) is a charming interactive book, and a favorite of Mali's (and a final Danielle choice). Little Bella is an imaginative girl whose animated adventures play out every time she closes her eyes -- as she dreams about being a butterfly, flying, diving like a dolphin: I'm honestly surprised by how inexpensive this app is, given the quality of its art and animation. I am backlogged with apps to review and will be talking about more of them (and adding them to the iPad Apps for Autism spreadsheet), soon. Once Leo's routine is reinstated, most likely. 2/26 update: Is this snow on my backyard picnic table? Not sure, but that's what we're telling the kids! We Californians have to get our wintry thrills however we can. *These apps were gifted to Leo by the developer. Which has no bearing on my review; I am featuring these apps because my kids genuinely like them. I almost forgot to post this -- we spent New Year's Eve at California's Joshua Tree National Park, near Palm Springs. It was one of our best family days ever. Ever ever ever. If your child with autism likes to hike and boulder, I couldn't imagine a better place to go -- as long as you're prepared. Joshua Tree is high desert, and in December that means ow-my-nose cold temperatures. If you go, check the weather report beforehand, take it seriously, and dress appropriately! For hiking, I'd recommend the Barker Dam trail. It is a relatively flat 1.5 mile loop -- flat in terms of elevation gain, not footing. There were many bouldery moments, which as a family of billy goats we all loved. We found snow! And ice! Mali is holding up a small slab of frozen H20. Iz testing the lake to verify that yes, indeed, it is frozen. The reservoir created by Barker Dam is small but lovely. It attracts the area's fauna, but to Seymour's disappointment we did not see any Desert Big Horn sheep. Iz pushing her personal bouldering limits. There's always time for a game of "my cheeks make excellent bellows"
See? Joshua trees! Return leg from Barker Dam. There were even petroglyphs. Though these ones have been messed with. We hit several other sites in the park, but the kids' favorite was Skull Rock and the bouldering behind it. The rough-textured granite rocks make climbing easy -- almost too easy. Your kids may get over-confident about their new super human climbing abilities, so mind them closely. There are many sharp drop offs on boulder backsides, and kids may not notice how high up they are climbing, and could get stranded. Leo billy-goating -- with close supervision. Wear jeans or other tough trousers. After a couple of hours of gamboling over the rough-textured rocks, Mali ripped the bottom right out of her pants! Which led us to sing her an impromptu personalized version of the SpongeBob Square Pants "Ripped Pants" song. She was mortified and made us all swear never to share it. We stayed nearby in TwentyNine Palms, at the Fairfield Marriott Inn. The hotel seemed set up for families, with complimentary breakfast, huge clean new rooms, and free wireless. Score! Recommended, especially with a spanking AAA discount rate. I think we'll be going back. A single day, no matter how full, was insufficient to appreciate this beautiful park. 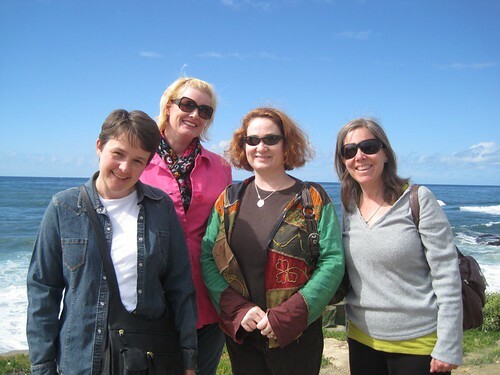 We're hoping to come back, possibly even camp (!). Have you ever been to Joshua Tree National Park? What did you think? This is before the french fries & milk shakes arrived and the table looked ... very different. Good friends make all the difference for me & Leo and our family. You'll note that it doesn't actually say "Shannon Rosa" in the show listing; it says "Temple Grandin: Autism & Fear." Because her interview was the first half of the show. Not a bad act to follow! The interviewers Marianne, Chuck, & Mae asked fair & insightful questions about iPads for our kids with autism, and I hope I managed to answer them sufficiently. And I'm hoping the recording cuts off before my quip about listeners playing a drinking game based on the number of times I said "definitely." My interview starts at 35 minutes in. GET AS MUCH STORAGE AS POSSIBLE. Poor Leo -- he thinks of his buddy the 16 GB iPad as the ultimate repository of every last app, TV show, movie, and songs he loves loves loves -- but, sadly, his friends can no longer play together because his iPad had run out of space. And as his cherished apps and shows disappear to make room for new and different ones, our change-rejecting boy who has gotten so used to having all his favorite media and apps in one place is going to become very sad. This apps/video iPad shuffle will only get more complicate as apps become increasingly robust, content-wise. I would love nothing more than to get our chemistry-lover Iz The Elements iPad app so she can explore the periodic table in depth, with 3D animation. She still has an iTunes gift card in her holiday stash; The Elements's $13.99 price tag isn't the issue -- the problem is the app's 1.71 GB size. We can't blow out an eighth of Leo's iPad's existing content for a single app. It's not going to happen. So, sigh, and if you're about to jump into the iPad market, please listen to me and buy as much storage as you can! Count TV ($2.99)*: An entertaining app that encourages understanding of 1:1 correspondence, i.e., that the amount two means the number "2." We've had this app since June, but Leo always goes back to it. The interface is simple: The Count does a short intro upon launch, then a nine-number grid appears (see above). Click on each number to watch a classic number-themed Sesame Street video. Leo gets yet another context for the numbers he's still struggling to understand, and I get to share videos from my childhood with my own kids. Win-win. I'm excited about Moozart ($1.99)** for Leo, on so many levels. 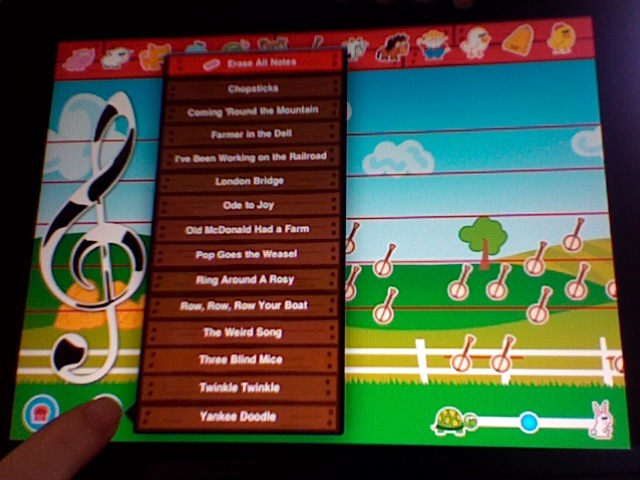 This app lets Leo play his favorite songs, then explore and experiment with them -- and with the basics of music and music reading. While being completely silly! 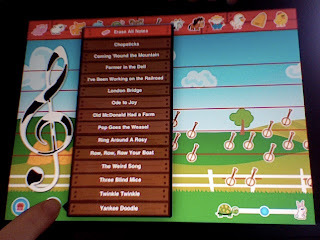 When Leo presses Moozart's Play button (which he recognized instantly, thanks to the app's good clean design), each song's notes appear as icons (pigs, bells, farmers) on a real music staff. Leo can delete or add other note icons from the bar above the staff, while playing an existing song or using a blank staff. Fun! (Though I couldn't find a way to save his creations -- he doesn't mind but other kids might). Moozart doesn't require users to know note names or time values -- if you place them in the right spots (and each time you move the icon to a new position on the staff, it sounds out a preview tone), you'll get the right note. Time is determined by horizontal spacing -- no worries about knowing eighth or half notes. Moozart allows non-readers to dabble and compose with abandon -- within the staff's range, at least. Reading is not necessary to play with the music, but it is necessary to choose a song from the app's song list, and this is where Leo surprised me. Moozarts' song list, unsurprisingly, overlaps with Leo's beloved Tappy Tunes's song list. Leo has memorized which Tappy Tunes song titles stand for which songs, but it wasn't clear to me if he'd memorized their positions or their appearance. With Moozart, Leo instantly selected favorite songs like Pop Goes the Weasel independently, the very first time he used the list. My son has memorized entire phrases! So, Moozart helps reinforce Leo's sight-reading (and generates much whooping and praise for our boy). One iPad benefit will never get old: I love interactive books that let pre-readers like Leo experience books independently. Leo's little sister Mali happens to already be a reader. She is also a big fan of the interactive book app Frida's World ($2.99), as am I. Frida's World is simple, well-designed, and the story and illustrations are adorable and age-appropriate without reducing Frida Kahlo's biography to twee. So now my six-year-old is knowledgeable about the life of Frida Kahlo and wants to know more! There's even a coloring book mode. Another benefit: Frida's World has both English and Spanish modes, which Mali appreciates as she goes to a Spanish immersion school and is always looking for fun ways to practice her Spanish. My only quibble: When in autoplay or "listen to book" mode, I would prefer to have the words highlighted as they are read. But this is a teeny quibble. Frida's World is a very cute and worthwhile app that lets sneaky parents like me inject a bit of culture into our kids' lives. *Gifted to my kids by the developer. **Free through Moms With Apps and their wonderful (Free) App Fridays. It's interesting, talking to people who aren't familiar with kids like Leelo and Jake about our boys' day-to-day lives. These talks make me aware of how fortunate we are, to have boys who think it's great to go on spontaneous frozen yogurt outings with all of their siblings and a couple of spare cousins. To know that our boys can usually if not always deal with a few dollops of chaos if we guarantee a payout at the end. To see boys who, after years of hard work, maturation, and the proper pharmaceutical support get to be part of the joyful family-and-friends flow I always imagined parenting would contain. It isn't always easy for our boys to go excursioning, but it used to be impossible. I took this picture because I want to remember moments like these, cherish them, and never take them for granted. Here's Leo riding his first-ever go kart racer with his dad, while we were in Phoenix over the holidays. He had a great time! This is also a good representation of the clip at which are days are going lately. Don't blink, is all I can say. There are two massive top secret projects on the front burner, I'm hoping I can share the news about them eventually. But even just living the lives we've arranged for ourselves is not an endeavor for the faint-hearted or the easily winded, not lately. So I'll likely be re-evaluating participation in a number of those day-to-day things, mostly with an eye towards improving quality of life with my family by being less tired and therefore less grumpy and twitchy, and snagging more hours of sleep than I can count on one hand per night. Reasonable goals. I have to say, I am really proud of The Thinking Person's Guide to Autism, even though crafting the associated book in a manner than does its content justice has taken longer than we editors anticipated. But as for quality of content: In the last two weeks on TPGA I interviewed vaccine expert Dr. Paul Offit about the most commonly held public myths about immunizations, I interviewed investigative reporter and The Panic Virus author Seth Mnookin about why we need to hold the media resonsible for allowing vaccine fears and misinformation to proliferate, we featured Mark Osteen's powerful insights on his son's never-ending attempts to talk despite largely uncooperative wiring, and Jennyalice wrote a barnstormer, When Medication Is the Right Choice -- a post I think should be posted on every parenting forum in the country (or dropped on the head of every parent who has ever gone around proclaiming "I could never medicate MY child" because they've been fortunate enough to have a child who doesn't require medication just to get through five minutes of a day, let alone an entire day). The International Meeting for Austism Research (IMFAR) is an annual scientific meeting, convened each spring, to exchange and disseminate new scientific progress among ASD scientists and their trainees from around the world. The first and primary aim of the meeting is to promote exchange and dissemination of the latest scientific findings and to stimulate research progress in understanding the nature, causes, and treatments for ASD. Dr. Regina Benjamin, [...] our major keynote speaker [will] address issues related to diversity among health care providers serving an increasingly diverse population of children and adults with autism and other disabilities. This conference provides a practical and useful update for primary care and subspecialty health care professionals caring for children, youth and adults with complex health care needs and developmental disabilities. This year’s topics offer new perspectives, research findings and clinical guidelines, including an overview of relevant information for pediatricians, family physicians, internists, and nurse practitioners who are involved in the care of individuals with autism spectrum disorders, cerebral palsy, and other disabilities. Even though the conference is geared towards health professionals, much of the information will be useful for families, too. I'd be so grateful to see familiar names and faces. By the way, it's Jennyalice's birthday today. Please go wish her joyeux anniversaire (she has a thing for French).